Boccasette is a small village in the municipality of Porto Tolle. It is situated in the 45th parallel (highlighted by a sign), its name is derived from its proximity to the 7th river mouth of Po, the so called Po of Maistra. At about 5 km from the city centre there is the beach described in this article. 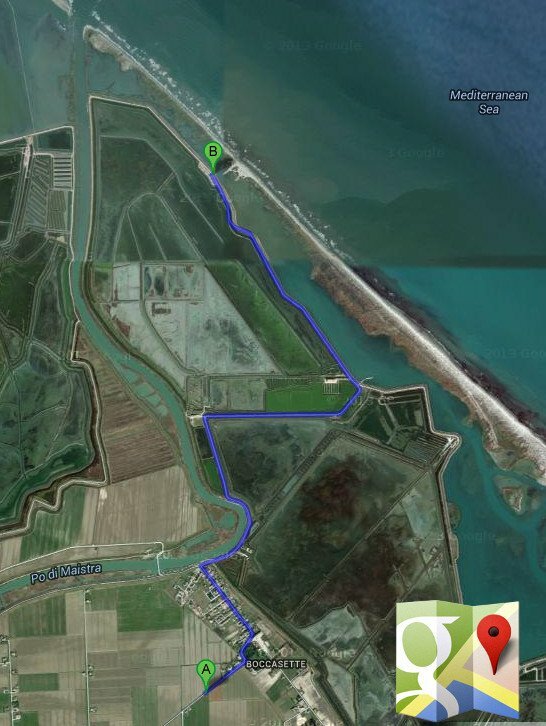 In my opinion Boccasette is one of the most beautiful beach in the Rovigo district, also it is easy to reach along the SS 309, a road that connects Venice to Ravenna. Firstly the water is clear without sediments and if the sea is quiet you can see a lot of fish and crabs. Secondly you can choose between free beach (delving into the wild coastal and lagoon nature) and the beach resort. Thirdly the sand has a little content of silt, in other words it doesn't remain glued at your body! For more information about this beach, visit the Official Portal of Tourism of the Province of Rovigo.